Amazing effect,, muscle pump "is achieved by the special composition of active substances which are precursors in the production of nitric oxide. Nitric oxide is an important signaling molecule cells, taking part in many physiological and pathogenic processes of the body. Comfort and health in one! 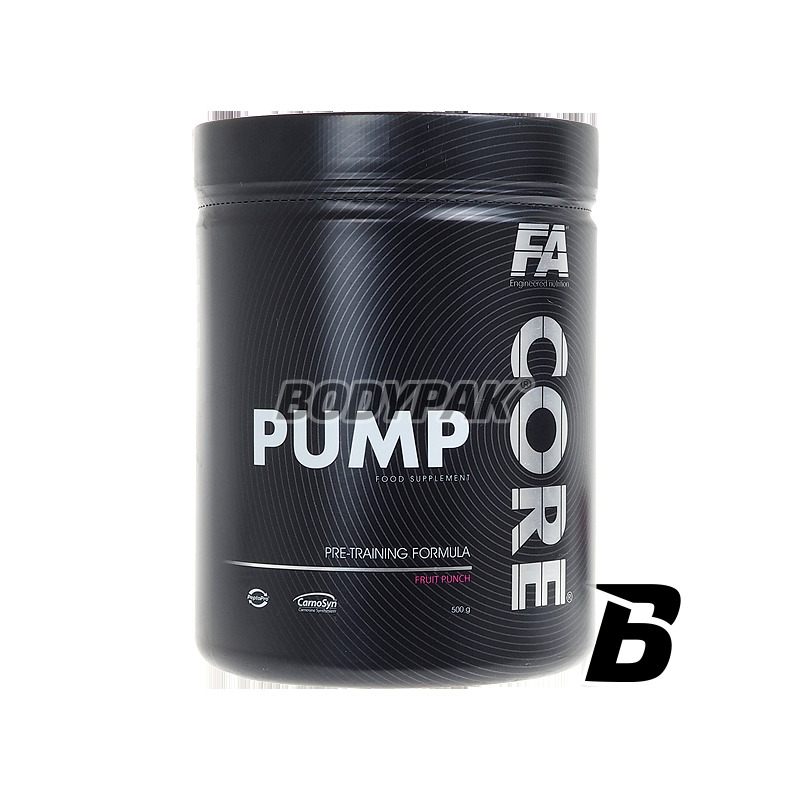 ,, Muscle pump effect "in the Pump line Core® achieved by the special composition of active substances which are precursors in the production of nitric oxide. Nitric oxide is an important signaling molecule cells, taking part in many physiological and pathogenic processes of the body. Nitric oxide is a potent wazodilator that affects the relaxation of vascular endothelial with the consequent need to expand the cross-section of all blood vessels, especially arteries. Wider artery can transport more blood and nutrients to the working muscles. The arterial blood has required oxygen to the muscle and provides nutrients, such as amino acids, sugars, creatine, arginine from the outside. Thanks to the action of nitric oxide constitutional transport is more efficient so that not only the cells receive nutrients but quickly removed from harmful products of metabolism. The use of pre-workout Pump increases aerobic capacity athletes endurance and improves the "energy and dynamism" effort strength. Using a supplement in accordance with the recommendations you can expect a rapid feeling of "muscle pump", which indirectly affects the growth of strength and endurance muscle. 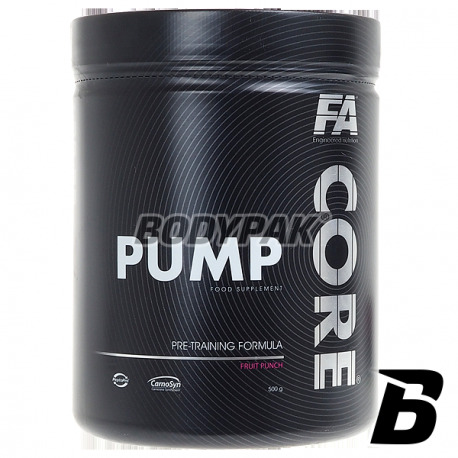 An additional advantage Pump is it does not contain any stimulants. The presence of beta-alanine (CarnoSyn®), BCAA, Citrulline Malate, hydrolyzed casein (PeptoPro®) in the Pump will make your workouts will be an experience that you will want to repeat at least 4-5 times a week. The molecule formed from the department of L-arginine and α-ketoglutaric acid - an intermediate molecule Krebs cycle - metabolic pathway leading to the production of the substrate energy for working muscles - ATP molecule adenosine triphosphate. As a result, this combination increases the "energy content" of this relationship and improving the absorption capacity of arginine in the body. Alpha-ketoglutarate similar to malic acid is a supplier of energy to the muscle cells. Due to the excellent solubility in water very rapidly and directly into muscle tries where it is utilized for energy purposes, and exhibits a similar resistance to the arginine hydrochloride to the acid environment of the stomach. It is a compound formed from the combination of amino acid citrulline malic acid. Citrulline is an amino acid, which is attributed to the action of increasing physical fitness through the multidirectional operation. First citrulline as the amino acid forming part of the urea cycle is involved in the metabolizing of urea to ammonia, thereby converting the toxic ammonia in the water-soluble and easy to remove urea. This cycle change, and thus the presence of citrulline is essential for high protein diets in order to avoid poisoning of the body. Another advantage of the presence of citrulline is its effect on the growth of cell metabolism, increased energy and increase the strength of which is associated with the participation of citrulline by nitric oxide production. Citrulline supplementation increases the synthesis of arginine, which indirectly increases the production of nitric oxide. Citrulline and arginine are amino acids in the organism that may be subject to mutual transformations, and unless the conversion of arginine to citrulline requires many changes the conversion of arginine to citrulline is a direct conversion resulting in the formation of nitric oxide molecule. Due to the presence of nitrogen oxide occurs in the muscles to relax vascular endothelium and the relaxation effect is to increase blood flow to the working muscles and provide them with a series of oxygen and nutrients necessary to continue to work harder. Increased blood flow helps the process of "cleaning" the working muscles. In each cell there is a specific exchange of oxygen and nutrients to carbon dioxide and harmful products of metabolism that your body needs to remove, and because of the increased blood flow such exchanges more quickly so that the cells of muscle tissue can last longer and work harder. Introduced in the form of citrulline malate molecule more readily diffuses to the working muscles in addition malate as one of the components of the Krebs cycle increases the "energetic" molecule. Beta-alanine as CarnoSyn® is a patented molecule beta-alanine. Amino acids in natural conditions are generally in the form of alpha-amino acids, but beta-alanine supplementation due to its properties appear to be appropriate and desirable. Beta-alanine in the body plays an important role in regulating the amount of current carnosine - a substance neutralizing the presence of lactic acid in the muscle developed due to intensive training, . Beta-alanine is an intracellular buffer which has a buffering capacity in hydrogen ions (pH stabilization muscle), wherein said donor is lactic acid. The hydrogen ions block the possibility of further work striated muscle by impairment of the nervous system communicate with the muscle tissue, which leads to the breakdown process in an efficient muscular contraction. Active Life beta-alanine is very long and approx. 40 days, so the possibility of its concentration in the muscles do not depend so much on the same amount of consumed, but since its use. According to a study admission of beta-alanine for a period of approx. 10 weeks increased muscle carnosine concentration to 80%. What does this mean for an athlete? Increasing muscle carnosine concentration of the second type (FTA FTb - fiber susceptible to growth by weight) by supplementation CarnoSyn®, increases the possibility of the muscle fiber to absorb a larger quantity of hydrogen ions H + caused by lactic acid production, therefore, there is provided a pH optimum . You can train harder and longer and using a balanced diet protein will achieve greater gains in muscle mass. TAURINE. This non-protein amino acid, sulfuric acid, commonly found in animal tissues, the highest concentrations are observed in skeletal muscle, heart, brain and retina. Taurine can be synthesized by the body's internal transformation of cysteine ​​and methionine but it is endogenous origin does not meet the demand for this amino acid, and therefore must be supplied with food. Taurine because of its construction (the group not solfonowa carboxy) does not form peptide bonds and is present in the body mainly in free form. Taurine has many physiological functions. This amino acid regulates the concentration of calcium in the body. He is a neurotransmitter and a neuromodulator and is responsible for osmoregulation, and also involved in the formation of bile acids and modulates the inflammatory process. Taurine antioxidant protecting muscle cells against the harmful effects of free radicals, which are formed mainly after intense and prolonged effort aerobic (oxygen) 1. Is an amino acid that affects improve the transport of active ingredients into the muscle through modulating the action of insulin. It gives a pleasant feeling "doenergetyzowania 'body without the effect of irritation or ,, przestymulowania" central nervous system. It works also an antioxidant, protecting muscle cells from free radical damage that is "oxidative stress" arising mainly after intense and prolonged exercise. BCAA is the main quantified amino acids in human muscle (which account for almost 40% of their dry weight) of branched chain amino acids belong to, ie those which the body itself can not be synthesized and must receive them from the outside with food. These are necessary ,, anabolic building blocks "that will build a strong and rock-hard muscle. BCAA free form are absorbed directly into the bloodstream because they do not have to be subject to etching processes, such as a protein derived from food intake. As a result, immediately after ingestion can get where they are needed most or to the muscle tissue. L-Leucine is one of the most important amino acids for the human body and especially the athlete because it affects the secretion of anabolic hormones such as insulin, particularly in combination with carbohydrates. Also affects the specific mTOR ,, '', thereby initiating muscle protein synthesis and pace of this process. Leucine has a beneficial effect on the reduction of body fat contributing to a better quality of muscle. L-isoleucine is an amino acid which is exogenous leucine isomer. It is a universal training about amino acid because it has the effect glukogenne and ketogenic. Alternative energy source of the insufficient availability of glucose and / or fatty acid, for example. During intense exercise. It is essential for protein synthesis. Adoption of appropriate dose before each exercise protects muscles from breakdown and provide isoleucine after exercise is an essential part of recovery after training and determines the repair of damaged tissues. L-valine is an amino acid exogenous another, the third branched amino acid, which is involved in muscle protein synthesis, and also in the process of energy production especially during severe physical and psychological stress. The use of additional doses of valine physical activity before, during or immediately after helps to protect against muscle protein catabolism and then the severity of the pace of recovery processes. Valine may also affect the level of neurotransmitters and relationships, which exerts gentle stimulation. Defers the occurrence of fatigue during intense and prolonged exercise. PeptoPro® is hydrolyzed casein derived from milk. A characteristic feature of this component, which indeed owes its enormous biological activity is the degree of hydrolysis. As a result of enzymatic degradation of the protein to give a product consisting almost exclusively of di- and tripeptides. As a result, the product provides components which does not require a digestion are absorbed directly into the bloodstream and may be a substrate for muscle building by providing a positive nitrogen balance, it is possible to enhancing muscle protein synthesis. In addition, rapid absorption of amino acids increases insulin secretion after exercise resulting in complement glycogen in muscle cells. PeptoPro® improves endurance, accelerates post-workout regeneration and reduces muscle soreness to allow for better and longer training.